The mystery was solved when I opened it and saw inside a row of handmade soap bars prettily presented. Already the presentation had me! 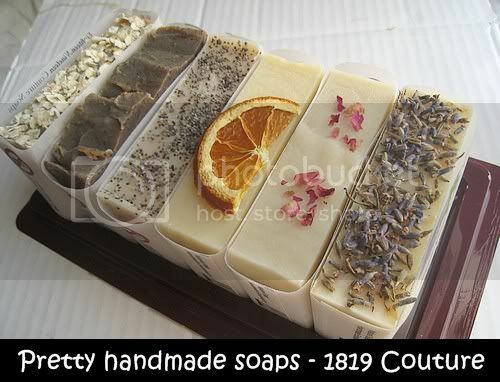 The soaps were from WeiBoon of 1819 Couture Soaps. I’d never heard of 1819 Couture Soaps but WeiBoon tells me that he’s been doing this for a while, selling them from InQBox at 1 Utama Shopping Centre until May 2009. He’s now taking orders by email and I was surprised at just how affordable and pretty his handmade soaps are. 1819 Couture Soaps are handmade soaps using quality oils blended with essential oils and herbs and made using the cold pressed method. The soaps smell lovely without that sharp chemical smell and do not contain animal fat, sodium laureth sulfate and preservatives. Above all, I think they are presented very well and make great gifts! Lemon & Poppyseed – Fresh smelling lemon with poppyseeds embeded in the soap. I cut out a piece and I like the slight scrub the seeds provide. Valencia Orange – Another favourite because it smells so fresh of oranges. My bathroom smells lovely every morning! English Rose – A fresh light rose scent. Not too musky or powdery. Just nice! Coffee – Perfect for coffee lovers and for skin exfoliation 🙂 Lovely pick me up in the mornings before your morning cuppa! Honey & Oatmeal – Smells sweet and good enough to eat! The oatmeal offers some exfoliation of the skin and this one’s good for dry skin as it helps moisturise the skin. Lavender – A top seller and I can see why! Lovely fresh lavender smell – no sharp chemical smell just a relaxing scent that calms you at the end of a long day. My favourite too! I love that it is labeled “Non Edible – Do Not Eat”! 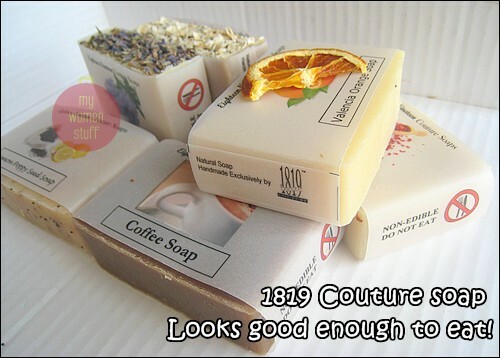 Its such a tongue in cheek way of saying that its good enough to eat but you’re advised not to 😉 And the name too 1819 Couture Soaps sound luxurious which belies the price. Each piece of soap is wrapped with a label telling you the soap ingredients and what its for. At the top of each piece of soap is a sprinkling of the key ingredients. Its a lovely touch that is aesthetically pleasing. Wow, it look delicious. Thanks for this post and I can’t wait the 1 eyeshadow, 1 blusher in 1 month challenge to end. I spotted them at InQBox 2 mths ago and really caught my attention. They do look so lovely and good to eat. Smells great too. Did u mean it is no longer sold in InQBox since May 2009? I won’t buy it for myself though as I don’t use soap. I only use liquid shower foam or gel. Its about 8×5.5 cm and 4oz in weight. All rough approximations only. Yeah I was so stunned when I saw them 🙂 Took a while to break them in. Wow, these look really pretty!!! I’d like to get some of that too! does it deliver to other places in malaysia? i so wanted to try out ! Of course these soaps are cheap, the fragrances used are synthetic and not 100% pure essential oils derived from plants. The citric fragrances such as lemon & orange are impossible to “lock” into soaps unless they are synthetic. Coffee, also would be a synthetic fragrance.